As the Vice President of Survivorship at the American Cancer Society (ACS), Catherine Alfano provides vision and leadership to ACS research, programming, and policy nationally. She is also an international leader in cancer rehabilitation and survivorship and has extensive scientific expertise in optimizing symptom management, follow-up care, health behavior to optimize healthy aging and reduce risk of cancer’s late effects. Last week we covered her professional journey, her personal mission of connecting cancer care and rehabilitation, and her groundbreaking research. 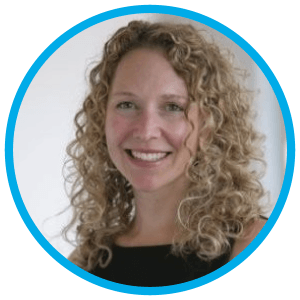 This week we’ll dive deeper into her experience as an innovator in healthcare and the lessons she’s learned along the way. Enjoy! INTERVIEWER: So you’ve shared some of the research you’re doing and the strides you’ve made in establishing this field of cancer rehabilitation and survivorship. What would you say have been your greatest tools or strategies for cutting through the complexity and really getting things done? CATHERINE: I’m really gratified to see that the pivot from fee for service reimbursement of healthcare to value-based reimbursement is making different groups of people talk to each other like they never have before to find innovative solutions to deliver better care. For example, we are exploring how to achieve the “triple aim” or better deliver care that results in better experience of care for patients, better outcomes for patients and lower costs to patients and their families and to the healthcare systems overall. Those solutions are not simple and they require talking to patients, families, clinicians,healthcare administrators, payers, and policymakers to find solutions that work. And we are now starting to talk about the “quadruple aim” adding a fourth piece that is avoiding burnout in our clinicians, because that’s another huge piece. When you’re talking about cancer, especially, research shows that a lot of our young clinicians are really suffering from the stress of constantly giving bad news to patients and they are burning out over the long run. We don’t want that to happen, because we already have a shortage of clinicians and we need them to bring their A game to the clinic to provide good care. So I think what’s really exciting is more attention being paid to listening to diverse voices from multiple stakeholder groups and collaboration to form innovative solution to thinking about how we meaningfully and feasibly fix healthcare and be focused on all of those different outcomes at once. INTERVIEWER: That’s huge. What strategies do you use to stay maintain healthy habits and avoid burnout in your busy professional life? CATHERINE: Ah, that’s a good question. I do a lot of different things. Again, if you think about the fact that I’m a rehabilitation clinician, I think of my own health as avoiding injury and being able to be active over the long run as I age. So I do a variety of exercise- I like to keep my body guessing. I work out on the Pilates reformer, and I’m a swimmer. I will occasionally run, though my back likes this less than it did when I was younger and I used to run half marathons. I do yoga. Spin class is a new favorite because it is really motivating and helps me be fit! I find that the combination of all of these different kinds of exercises really helps me avoid injury. INTERVIEWER: That makes sense – Cross Training! CATHERINE: Definitely, and embracing exercise as fun. Finding more fun, more joy, and more purpose in your day helps avoid burnout. This is true across all types of people and it is something we need to help our clinicians achieve as well. For example, another contributor to burnout with clinicians is the amount of paperwork — and it’s not paper anymore, it’s electronic — but it’s still the amount checkboxes, and documentation that makes them ask, “What’s the point of what I’m doing? I don’t get to spend any time with my patients anymore.” So I think that the future is really going to be about finding innovative ways to cut down on that administrative burden so that clinicians can spend more time with the patients they’re trying to help and patients can get the help they need. INTERVIEWER: Awesome. Have you seen any promising innovations in this particular space? CATHERINE: I think technology is going to help. But right now, when I say that, I get laughed off stage from some clinicians who really feel like technology has done nothing but make the administrative burden worse so far. Unfortunately, for the clinician in his or her clinic, technology is what brought the boxes to check. But my point is, “Okay, so far, technology has made your life worse, but we can also harness technology for the better.” We need to make technology work for patients and for clinicians. There’s just so much potential there. INTERVIEWER: Can you provide an example? CATHERINE: One cutting-edge, and really very cool example, is in the collection of patient-generated data. If someone’s going to cancer treatment, there’s a big movement afoot to have them fill out multiple questionnaires about all of their symptoms. And this is really important, because how do your clinicians know you have fatigue, depression, or your functional impairment, etcetera unless we ask about those problems all the way through your cancer therapy and beyond? But of course, patients don’t want to sit there filling out forms all the time, especially when it’s the same form over and over. So enter technology. Enter digital health. Companies in the digital health space, Pack Health included, are really innovating in the collection of symptom data so that it’s patient-generated data, rather than patient checklist reported data. neuropathy and cannot feel their feet or balance well is not really safe to be walking around without seeing a physical therapist to help with walking. Well, rather than asking the question, “Hey, are you falling when you get up in the middle the night to pee,” a device like an Apple Watch or a Fitbit can detect that so that we don’t have to ask these questions. Similarly, there’s a company out of Boston that is really innovating in the ability to detect depression. So, right now, how do you know somebody becoming depressed? You ask them questions like, “Are you feeling blue most of the time, all day long every day in a two-week period?” Which doesn’t take into account the fact that sometimes, people don’t know what they don’t know. So this company is now deploying an app that runs on your cell phone that detects differences in how you speak and what you say that actually predicts whether you’re becoming depressed—maybe before you know it and would report it on a questionnaire. How cool is that? INTERVIEWER: So cool. So what do we do with this information? CATHERINE: That’s the important thing! We are seeing such innovative creative work happening with the ability to predict the problems a cancer patient will go through and the best interventions to help with these problems– understanding how to leverage all types of patient-generated and other “big data” using artificial intelligence algorithms. We need to get that from what most people think of science fiction into the clinic in ways that are really meaningful. We need to make those data work for clinicians and for patients, and figure out how to use that information for better treatment decisions. And then there are also the applications outside the clinics— for example, to deliver self-management interventions. Many patients want to know what they can be doing to help optimize their own health (which we call self-management). So, how do we change patient portals so that they’re not just places where you go and look up the labs you just had, and what your cholesterol level is? How do we change them into dynamic self-management platforms? Or can Pack Health leverage that information that so that patient portals auto refer people to programs that can help them? INTERVIEWER: For sure. Now I have to ask when it comes to digital health and patient-generated data, do you think privacy concerns are a barrier to innovation? And how do you address that? THERINE: It definitely is – some of my own research has actually shown that when I was back at the National Cancer Institute. 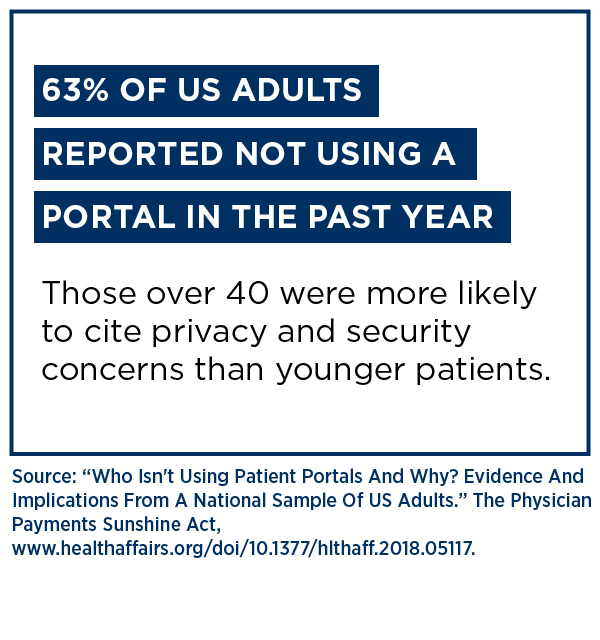 We know from surveys like the Health Information National Trends survey that patients have big concerns about data privacy. But patients are also willing to share their data if those data doing something helpful for them. We need to leverage the strengths of technology to get people the help and support they need. That requires getting them to report all of the data they may need, having that happen outside the healthcare system, and using that data to engage patients in their care. All of that has to happen in a way that is secure, and that is a huge challenge for the future. Because right now, a lot of our older generation don’t want to have anything to do with using electronic platforms of any kind for their health data. It’s a real fear that patients have: they don’t want to be discriminated against for anything that’s online about their medical history. We’ve got to deal with that on a policy level. INTERVIEWER: I love that you’re so in tune with the patient perspective. Can you tell me more about how you keep your finger on the pulse of patient experience? CATHERINE: It’s so important to me to understand the needs of patients, caregivers, and clinicians. I’m not in the clinic myself anymore, but I have the wonderful opportunity to speak to all of the different kinds of stakeholders that I’m trying to help. I speak a lot of clinicians, I speak a lot to researchers, I speak a lot to patient groups.They tell me what’s going on with them and I encourage them to tell me what’s going well and what needs fixing. Because otherwise, if they’re not making me aware, then I’m not going to be pushing for solutions that work for them. In every project or the multi-stakeholder initiatives that we’re pushing forward, I consider it my job to make sure that all of those perspectives including those of patients and families and clinicians are at the table. We have to have these voices engaged or the solutions that we’re trying to enact won’t work. Pack Chats are all about getting to know the human behind the innovation. If you have other inspiring humans we should get to know, make the connection by emailing maggie@packhealth.com.